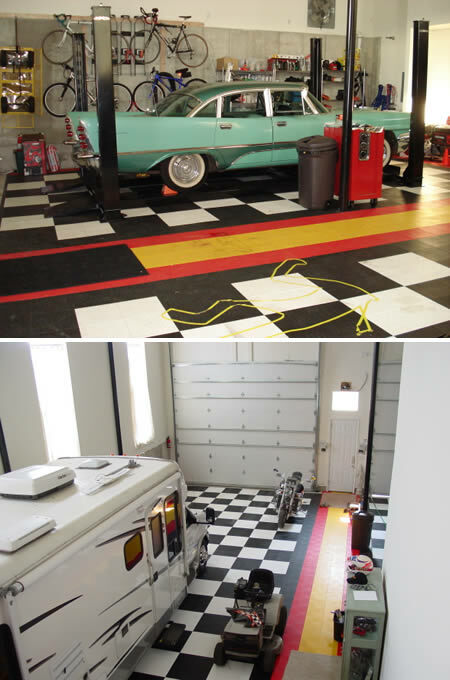 A garage, spare bedroom or a basement; every man needs his own space in the house. 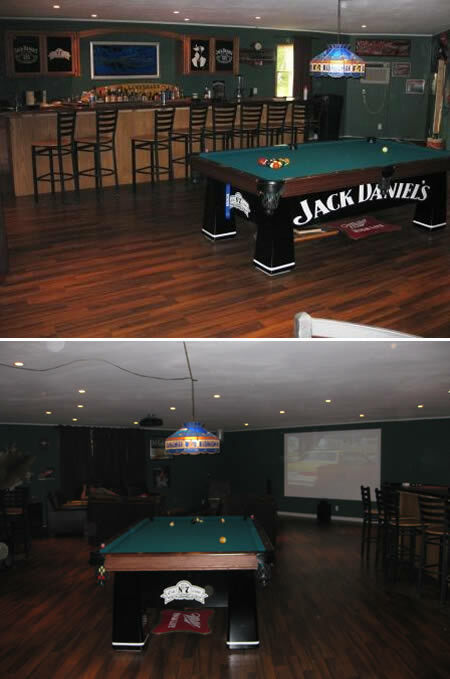 Meet twelve of the coolest man caves we've ever seen. 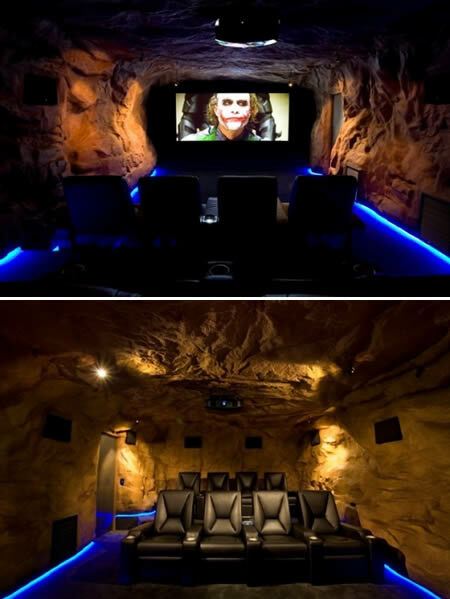 Ever wanted to say: “To the Bat Cave …” but felt a bit of joker uttering those words out loud? So how does a home entertainment enthusiast 'Down Under' in Melbourne, Australia, get away with saying it? Constructed in the owner's home basement from scratch by Frankston HiFi, this CEDIA award-winning special installation had to be built from the ground up, literally. The carpet was the first thing to be laid inside the ‘concrete cabin', then the walls were constructed on top of that. Last thing to be installed was a special 10ft (3m) curved screen (the first one installed in an Australian home). Entry to this ‘secret location' is via a remote-controlled pneumatic sliding door. A touch of the panel outside and the door opens, the lights turn on to a predetermined level, the projector and scaler come to life, and the processor goes into action. So, by the time you've chosen your movie and had your first mouthful of popcorn, everything is humming along, just like a well-oiled Batmobile. 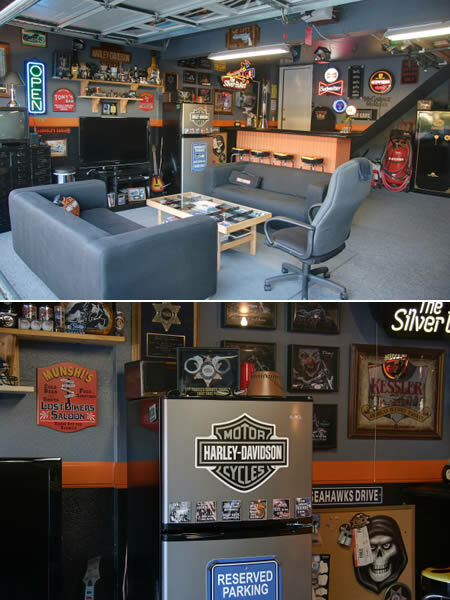 If you dig motorcycles you are going to dig this Harley garage man cave. 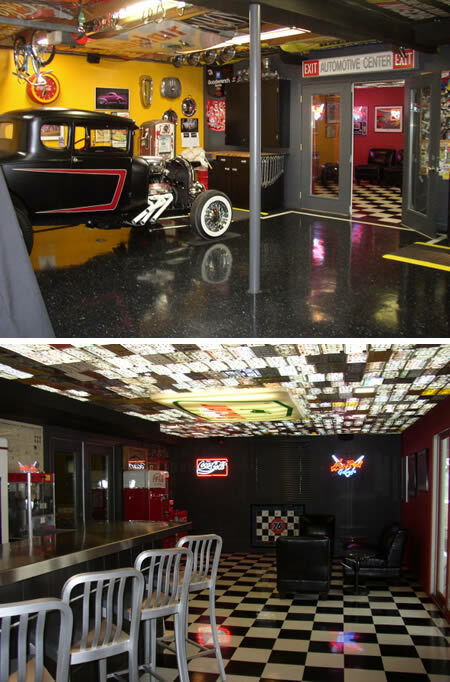 Fun car guy garage with adjoining bar and bathroom. Decorating inspiration from repurposed automotive objects. License plates on ceiling, signs, front end alignment system for back bar. Who says women aren't allowed in a man cave? 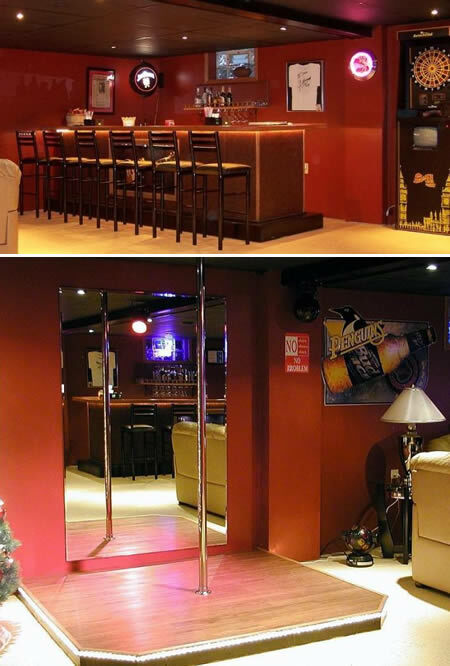 This man cave comes with a 6' x 6' Stage with Stripper Pole and Spotlight. 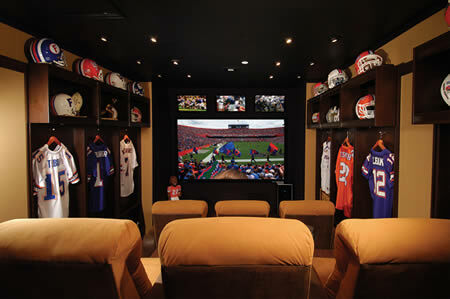 Wonderful man cave from Steve Dodds from Sydney. 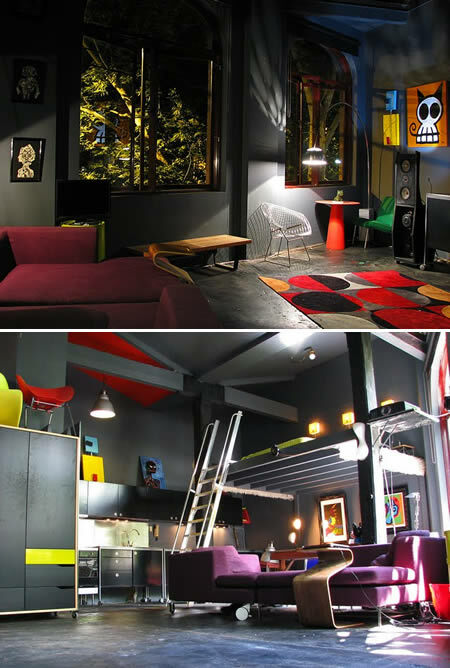 The dark walls, ceiling, and floor are bold and really make the colorful furniture pop. The furniture and hardware were found by scouring ebay and Ikea, and he did almost all of the installation work himself. Steve clearly has a distinctive style and it is expressed through a clean contemporary look. 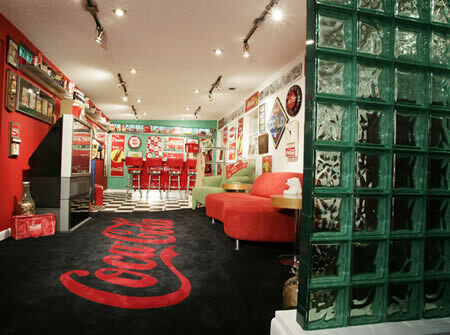 Vintage Coke advertising signs and small collectibles, displayed on green glass shelves cover the room's walls. By Rate My Space user rayscokeroom. Want to know what football heaven looks like? Just ask this super-fan, who created a shrine to the University of Florida, right in his garage. 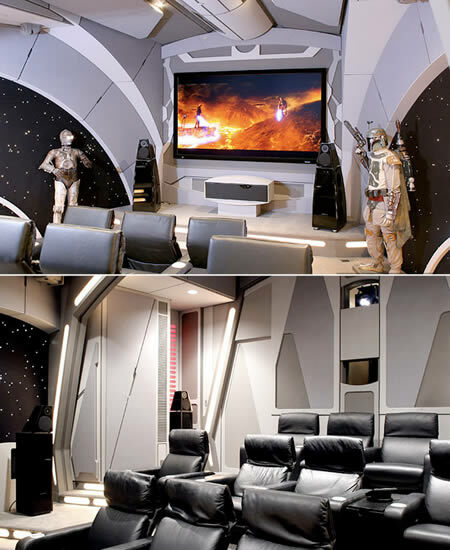 The 13-by-22-foot room also has three 32-inch Sharp LCDs, a 110-inch Stewart Filmscreen fixed display, a Sharp 1080p DLP projector, 7.2-channel surround sound, a PlayStation 3, Lutron lighting and Crestron touchpanel control. It's also got a full wet bar, an icemaker and two beverage centers. 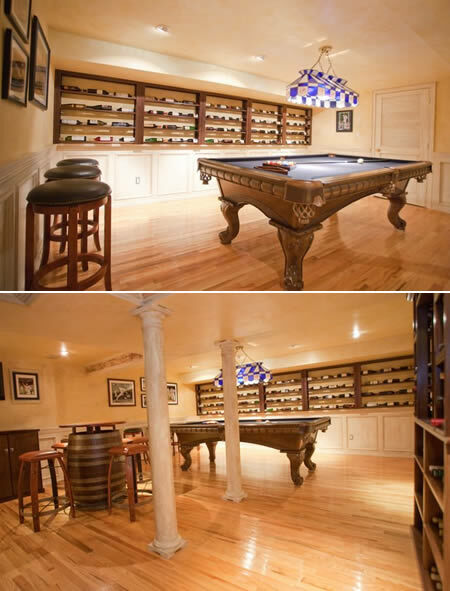 This basement was transformed into a real "man cave" with a very unusual theme - New York Yankees + wine cellar. 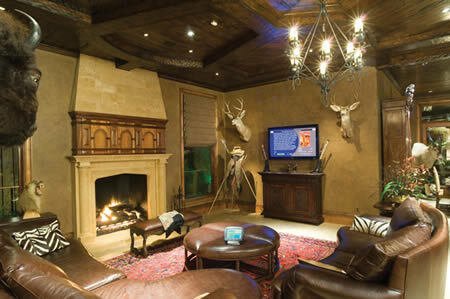 Instead of creating your typical game room, the owner of this 12,000-square-foot Dallas home wanted something that could display wild game. To keep things cool and lit properly, the house has 39 Crestron control interfaces—35 of which are wall-mounted. The media room features a 116-inch Stewart screen, a VX-2000d CW DLP projector, a 7.1-channel James loudspeaker system and Halcro processing and amplification. Throughout the rest of the house there are another 10 Runco plasmas, a Samsung LCD and Monitor Audio Gold IW in-wall speakers, which feed most of the 16 audio zones. The ultimate boy's space. Man can grow old but never grow up... Three stories in height attached garage almost 2000 sq. foot. 14 foot tall garage doors. Racedeck floors ,two story windows Stadium Lighting. TV stereo couches on the catwalk.